The APPLE (Adults Providing Positive Learning Experiences) Program places screened adult volunteers in classrooms of their choice in Santa Maria, Nipomo Elementary School, Orcutt, Guadalupe and Lompoc area elementary schools. All volunteers undergo tuberculosis testing and fingerprinting prior to placement. The volunteers, mostly seniors, spend a few hours each week in the classroom mentoring students and helping them with reading and math skills. 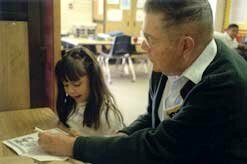 Through this interaction, children are given the chance to grow both academically and emotionally, while seniors have the opportunity to fill an emotional need that may otherwise go unmet. Volunteers who have been with a class for three or more months can request a mini grant of $150 to $200 from GenSpan to use toward books, field trips, or anything else that the class may need. Each volunteer can apply for a total of one mini grant per year. Mentor Natalie Axelrod enjoying end of the school year party with students. Mentor Lew Howell with a student at Alvin School in Santa Maria. Mentor Mike Axelrod with students at Mary Buren School in Guadalupe. Story Catchers is an outgrowth of the APPLE Program that allows children to explore the lives of other generations by interviewing seniors and writing stories based on their responses. 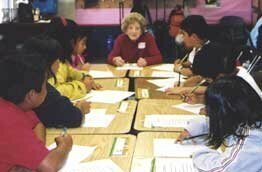 GenSpan brings the senior volunteers to elementary school classrooms where the students are split into groups and each group given one volunteer to interview. Once all of the stories are complete, they are taken by GenSpan and compiled unedited into a book, and copies of it are presented to all those involved. 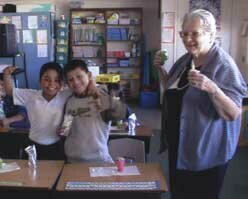 Volunteer Ann Ferrar at Robert Bruce School. The GenSpan Foundation would like to bring to the attention of the school children, the wonderful history of Santa Maria. In the schools, students learn so much of world history but little is know of the local history. 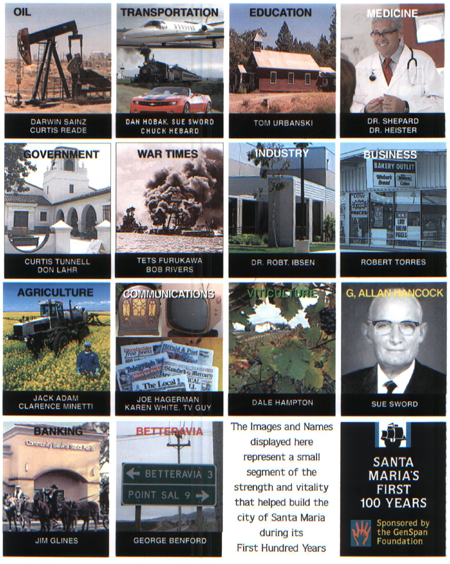 We will put together 14 DVD of Santa Maria First Hundred years and upon completion will distribute the videos of the school, so the students can see and learn of the history of Santa Maria and the many citizens who were a vital part of making Santa Maria an All American City.